Pour non-fat sweetened condensed milk into a microwave-safe bowl or pitcher. Microwave at HALF POWER for 6 minutes, stirring every 2 minutes. Place Cheerios™ in a plastic food storage bag. Zip to seal and crush with your hands until coarse crumbs are formed. Add 2 Tbsp Cheerios™ crumbs to each of 4 small serving bowls or glasses. 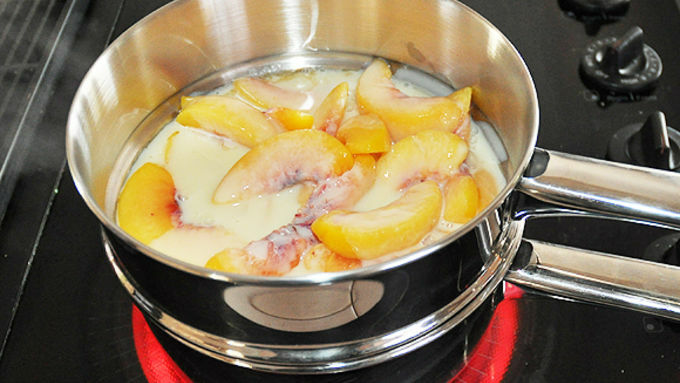 Ladle peaches and milk mixture over crumbs, dividing peaches between dishes. Note: You can serve more or less of the sweet milk sauce, depending on individual preferences. Garnish with non-fat whipped topping and a dusting of the remaining Cheerios™ crumbs. Serve immediately. Is winter wearing you down? 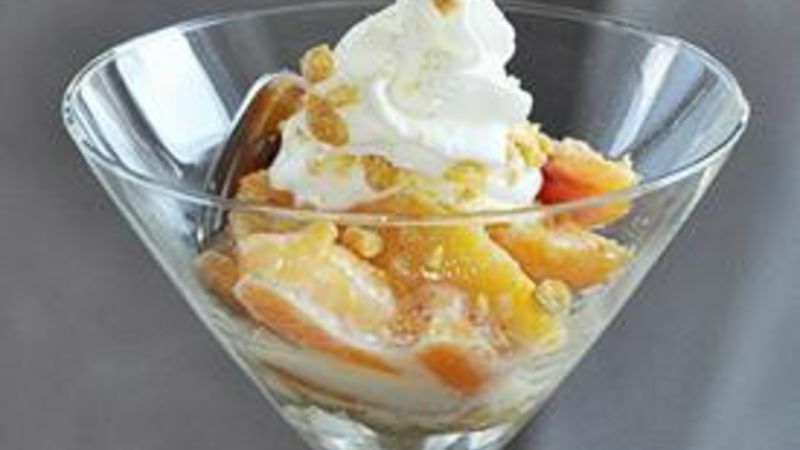 Perk up and let summer come to you with this non-fat sweet peach dessert! 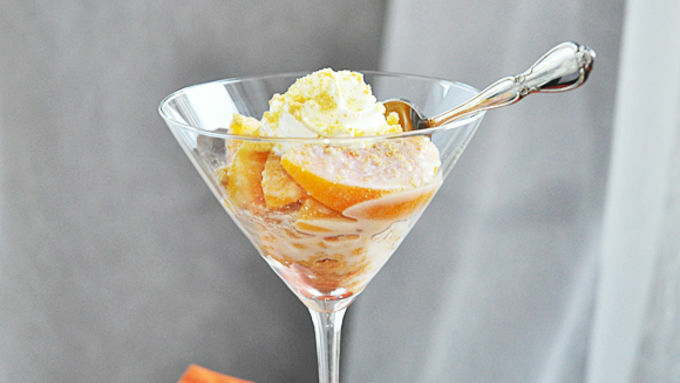 Escape to the warmth of a winter get-away when you make this Skinny Dulce de Leche Peaches dessert made with non-fat ingredients! I'm tired of winter (already). But I tolerated the chill just one more time -- long enough to slide my mittened hand into the freezer case at the market and snag a bag of Cascadian Farm sliced peaches. With that, some Cinnamon Burst Cheerios and 2 other ingredients, I was ready for this. My fam couldn't tell these were frozen peaches. They tasted that fresh. My son who hates anything in the fruit section of the food pyramid actually liked this dessert too. My husband had three helpings and called it dinner. I shut my eyes on this 8-degree day in Minnesota and found an 80-degree beach on Fiji. 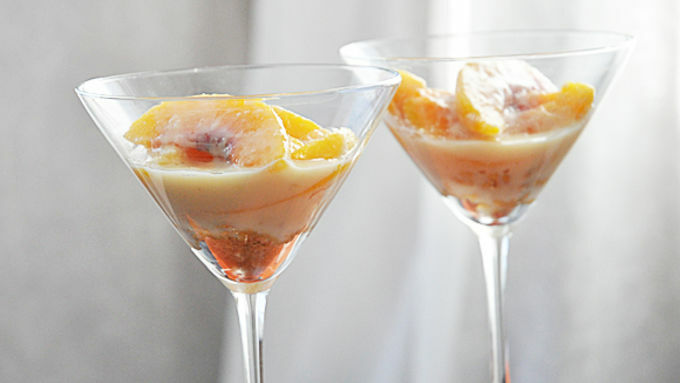 More Summery Desserts to Enjoy in the Wintertime These desserts feature frozen fruit, so you can make them any time of year!